A view from the crowd of the ceremony in progress. 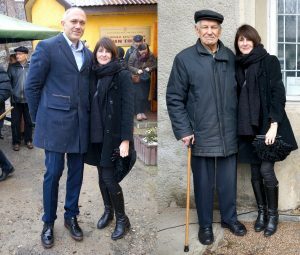 After two years of development, Rohatyn’s new regional history and ethnographic museum “Opillya” opened to the public yesterday, and Jay and I attended the ceremony on behalf of descendants of Rohatyn Jewish families. The opening coincided with the first snowfall of the season, but that did not dampen the strong turnout led by Rohatyn’s Mayor, Deputy Mayor, numerous city staff, the museum’s director and deputy director, clergy from the local community, administrators from the Ivano-Frankivsk Oblast, plus authors and artists who have Rohatyn roots or have published works covering Rohatyn history. Over one hundred Rohatyn residents attended the opening, which was also covered by local media. 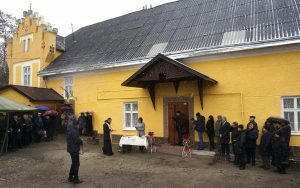 Prior to the ribbon-cutting ceremony, there were several speeches as well as a blessing, and despite the cold temperatures, a musical band and choir also performed. Marla with two of the city’s leaders at the ceremony: Mayor Nasalyk and Mykhailo Vorobets. 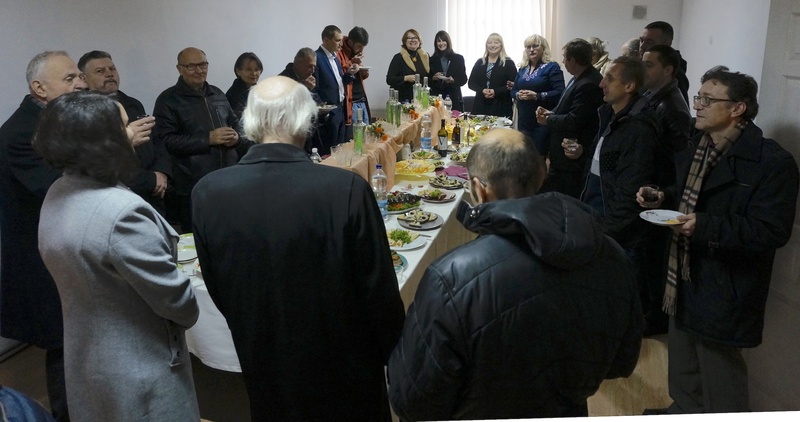 It was a special treat for us to again see our dear friend and long-time heritage supporter Mykhailo Vorobets, accompanied by his family, as well as Andrés Rodriguez, the new U.S. Peace Corps volunteer in Rohatyn, and many other Rohatyn friends. The five-room museum is housed in a historic building which once belonged to the Lubomirski family, who were prominent Polish land magnates. The ground-floor exhibition space comprises four rooms which radiate off of a central hall. 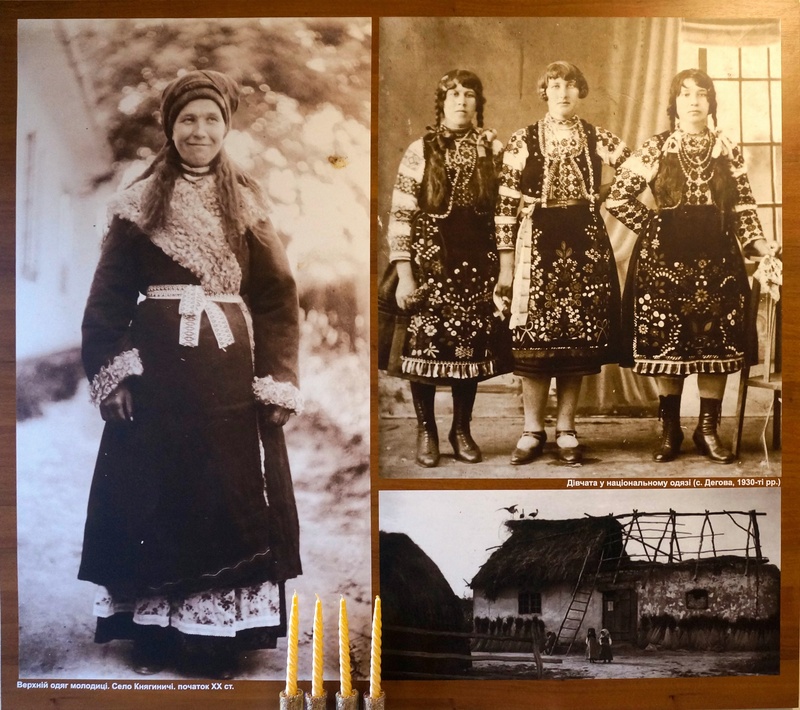 This hall also serves as an entrance lobby, incorporating historical photos of local people in traditional folk dress; many of those images are enlarged so that the people depicted are life-sized, creating an attractive welcome from local people of the past. The entry hall is packed with visitors. The exhibition rooms are designed thematically with a chronological thread, documenting the formation, development, and changes in the communities of people who settled, worked, and lived in the Rohatyn Opillya region – an elevated land area which surrounds the city of Rohatyn and includes numerous other towns and villages. The displays and information begin with regional findings dating to the Paleolithic period, and progress through the 20th century. 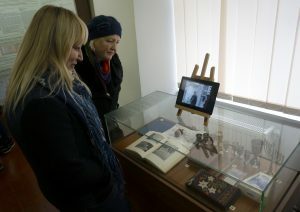 Many of the exhibition artifacts were donated by local residents, including writers and historians such as Mr. Vorobets. Villagers from the past greet the visitors. Each of the four side rooms includes several large and detailed informational panels related to the room’s theme on each wall, plus copies of historic photos, maps, and records, as well as three-dimensional objects and artifacts (some original, some reproduction) which are representative of the period or theme in the region. The objects include clothing, household items, farm implements, school records and publications, and of course home crafts and family memorabilia. The museum staff is still actively collecting pieces for its exhibitions, but already has an impressive variety of region-specific embroidered clothing and folk art, documents, and more. Museum director Olha Blaha explains the history of graphic designs made by Ukrainian-Polish Rohatyn resident Roman Hrytsay, original artwork donated by Mykhailo Vorobets. Behind is a fine collection of original pictorial postcards of Rohatyn, donated by Piotr Lewicki. 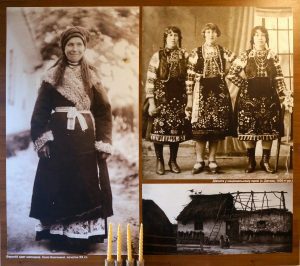 Although the people we now call Ukrainian settled this region very early, and now make up the vast majority of residents, the museum presents interesting information and artifacts from other peoples who settled for brief or extended periods, and who left key cultural traces. 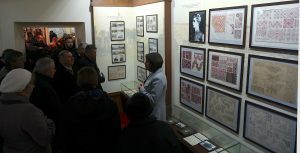 In one exhibition room, visitors can learn about the Polish community which made up an important minority of the town for centuries, and about the impact of the Ottoman Empire in its short but substantial encounters – from the Ukrainian peasant girl Roxolana, who became the influential wife of Süleyman the Magnificent in the 16th century, to the many Turkish soldiers who fought with the Central Powers against Imperial Russia near Rohatyn in World War I (some of whom are buried in military cemeteries around the city). 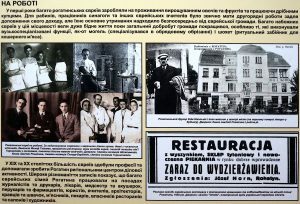 The Polish component of the exhibition is still rather small, but the museum hopes to engage descendants and the Polish embassy in Ukraine to supply more records and artifacts; in the meantime, fascinating views of old Rohatyn relevant to everyone are on display in a large group of original historical postcards generously donated from his personal collection by Rohatyn Shtetl Research Group (RSRG) member Piotr Lewicki. Olha leads a tour of the Jewish community exhibition. An excerpt from the cultural history panel, the section “At Work”. This room also features Rohatyn’s significant Jewish community, which flourished for 350 years in the city before its destruction during the Holocaust. After the invitation by the City of Rohatyn in June of last year to contribute to the exhibitions at the museum, Rohatyn Jewish Heritage was very pleased to work with the newly-appointed museum director Olha Blaha and her staff to create a small permanent exhibit about Rohatyn’s prewar Jewish community. Over the next year, we researched and submitted detailed texts covering both the chronology (developed from our online history of the Rohatyn Jewish community) as well as cultural characteristics of the lives of Rohatyn’s Jews, in both English and Ukrainian (translated for us by our friend Natalya Kurishko) to minimize the museum’s effort, and we submitted images from our own collection and many others donated by members of the RSRG, which the museum’s designers then fashioned into the exhibit’s information panels. We submitted more information and images than could be included in the available exhibition space, but even the trimmed exhibit, based on two large information panels with many photos, gives an excellent introduction to the Jewish face of Rohatyn’s past. 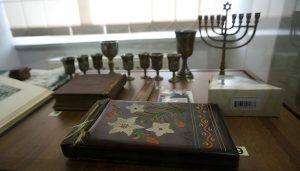 Donated Jewish artifacts in one of the display cases. Thanks to donations by Rohatyn Jewish descendants, the exhibition also includes Rohatyn-specific and general cultural objects in two glass display cases to illustrate some of the unique features of the Jewish community, including archival records, family photos, a Hanukkah menorah with candles, a mezuzah and script, kiddush cups, a kippah, a tallis and sleeve, and a personal memento album from a Rohatyn emigré. Together with some representative cultural items, I was pleased to donate a dress originally worn by my great-aunt Bronia Horn in the 1930s, made for her by a close school friend and gifted to me by that friend’s daughter, now a family friend in Israel. Visitors are captivated by the Fanny Holtzmann video. As we guessed, a highlight of the exhibition is a digitized version of a short film originally made by Rohatyn Jewish descendant Fanny Holtzmann in 1932 during her visit to the city while in Europe on business. The video runs in a continuous loop on a computer tablet currently placed on top of a display case in the room. The 5-minute treasure caught the attention of many museum visitors, young and old, with its scenes of Rohatyn people and places from more than 80 years ago. Bringing that video to Rohatyn was the result of cooperative work by YIVO, RSRG member Logan Kleinwaks, and our NGO, and was made possible by a very generous donation from the Borovitz family, descendants of Rohatyn. A festive lunch closes out the ceremony. A separate entrance on the ground floor leads to a museum library which already includes additional donations from Rohatyn Jewish descendants, plus the office of the museum director. On the level above the office, the museum also houses a large conference room which has been designed to present temporary exhibits and educational seminars to be developed in the future. 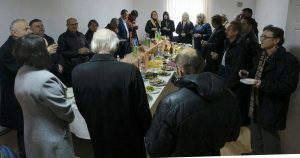 Following the opening ceremonies and our first look at the exhibitions yesterday, the museum hosted a generous Ukrainian lunch in the conference room for VIP attendees, museum staff and contributors, and invited guests including Rohatyn Jewish Heritage. For another glimpse of the museum and coverage of the opening ceremony, there is now a 12-minute video produced by the City posted on YouTube as part of their “New Town” series of presentations on topics of interest to its citizens and others in the region. Slava interviewing Marla for the Shofar newspaper of Lviv. 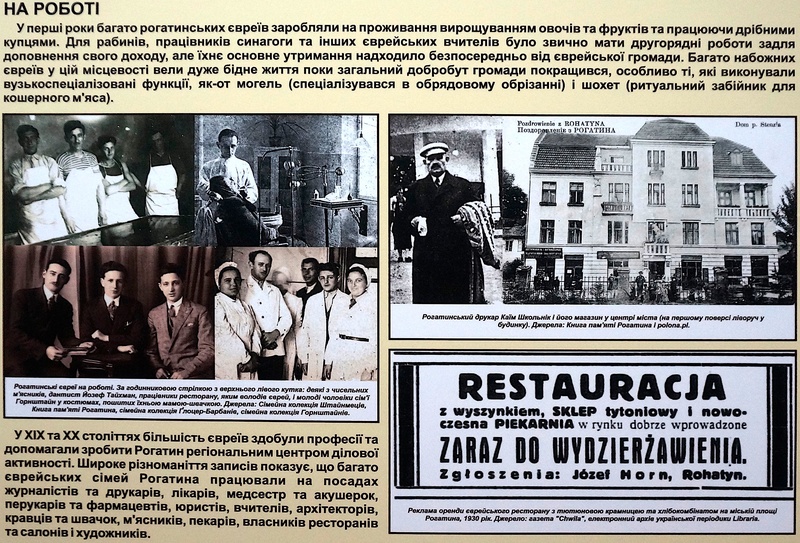 In the coming months, Jay and I will create an English language guide to the Jewish exhibition, for the benefit of museum visitors who are interested in the local culture but do not read the Ukrainian language. We also look forward to further studying the information panels and displays in the other rooms, to expand our appreciation of the breadth and depth of Rohatyn’s multicultural history. 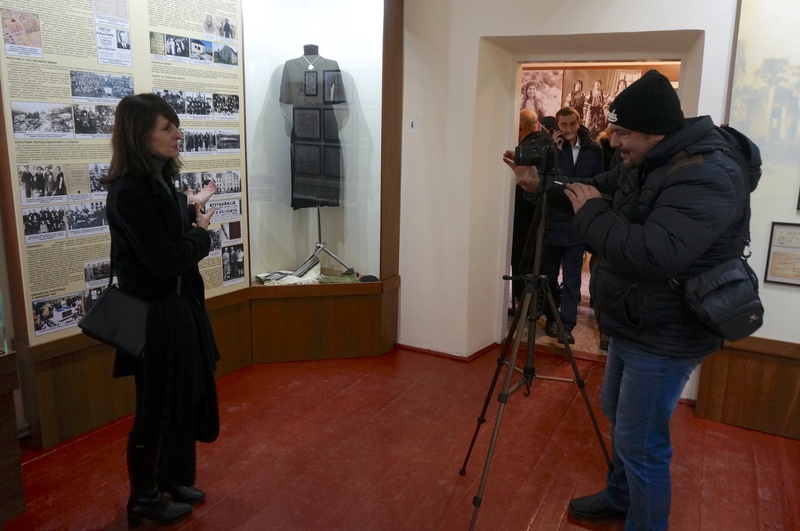 We thank our friends from Lviv who traveled with us to the museum for the opening, including Slava Durach of the Lviv Volunteer Center and representing Lviv’s Shofar newspaper, and Sonia Engström and Gustav Söderström of viewpoint-east and Lviv Resor. And as always, a special thank you to our dear friend Vasyl Yuzyshyn for driving and interpreting for us. Olha guides visitors around the exhibition of early 20th-century Rohatyn documentation. The many donors of information, images, and artifacts should be very proud of their contributions to remembrance of the Rohatyn region’s multicultural past as a basis for building a bright future. 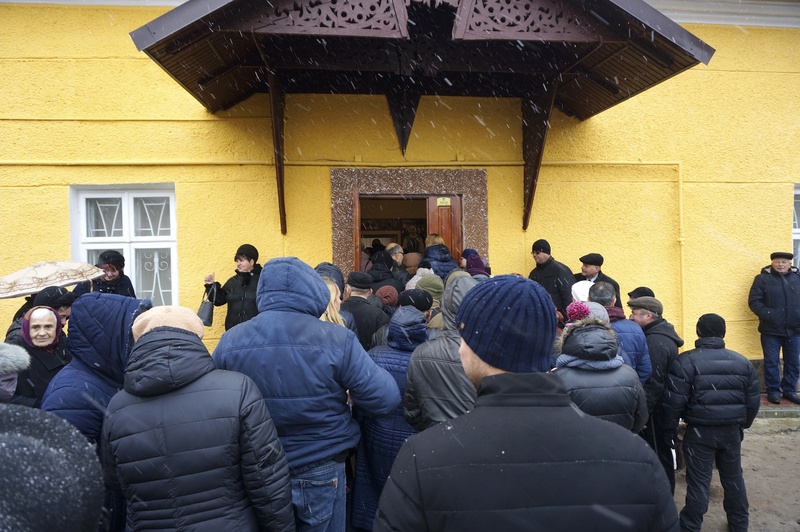 In addition to serving as a valuable resource to the residents of Rohatyn and nearby villages, the new museum will be a key stop for visitors from around Ukraine and from abroad, and an important starting point for exploring and understanding the region. We applaud the City of Rohatyn and the staff of the museum for their perseverance in bringing this resource to the public, and we look forward to continuing our cooperation with them in the development of educational projects and events. The museum is located at vul. Halytska 52, just south of the town square; the initial public opening days are Monday through Friday. Some additional views of the opening ceremony and the new museum’s exhibitions. All photos © 2018 Rohatyn Jewish Heritage.